Flaap.io is the best Flappy bird multiplayer game you can find in Google Play Store. This game runs on the on a simple basic but it’s really fun to play. There are no complications in this game all you have to do is put down your name and sign in or you can play as a guest user. It has 2 options 1st is Multiplayer and 2nd is single player. After signing in you will see a bird, you just have to click on it and the game begins. 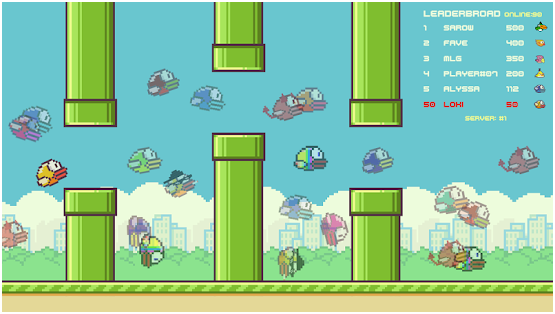 So the simple basis of this game is that you have to score most points by flapping the bird from the space between the 2 pipes. Yeah I know that sounds easy but believe me when I say this is not as easy as it sounds. For the first 10 times, I didn’t even cross the mark of 5 points and I challenge you that you won’t be able to do it either. The gameplay is very cool and the graphics are nice too. The gameplay is authentic and the graphics have a retro style, which is loved and adored by all ages of people. This is all fine and good but the best part about this game is that its available in multiplayer and we all know what that means. You can play with whomever you like, so challenge your family and friends and show them who is the boss. Score more points than them and become the best player. The more you play the more experience you gain and this is the only key to perfection in this game. This game is super addictive and I’ll guarantee that you are going to have hours of fun playing this game and you will also brag about your score to your friends. And to keep you addicted to this game we also have birds of different level and different speed with different colors. So as you reach to the higher levels you are going to have a slight difficulty in maintaining the speed of your bird as they tend to get pretty crazy after every level and also look out for their change in movement. The moment you start this game you are playing with the players from all around the world and on the upper right corner you can see your score as well as your rank and tell them also that you have the skills to beat each and every one of them. The other birds on your screen are actually the other player which are competing with you in this game, and you have to score more than them, in order to claim the highest record possible. As you can see their birds are flapping faster than yours. This is happening because they are on the higher level and they have got a reward for that. This game is of 8.4mb so as you can see, it takes a very little space on your android and provides a multiplayer mode, so what are you waiting for download this game now and have loads of fun. This game is short and simple so all the players of different ages can play the game.